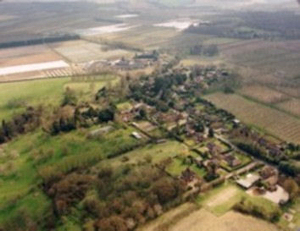 The village of Selling lies about 4 miles to the south east of Faversham in the Kent countryside. It has many interesting houses and lying just on the edge of the Kent Downs, has a varied scenery, from chalk to downland to sand crowned hills. Selling CE Primary School is a small, caring Church school with a family atmosphere, high academic expectations with firm but fair discipline. The School offers: small reception class of approximately 16 children small infant unit, self contained play area, links with local, playgroup, flexible starting arrangements to take account of your child's needs options on travel arrangements. For more information, please contact the school 01227 752202 or visit their website. The club plays at a picturesque ground in Selling about half a mile from the White Horse pub going towards Boughton and is in the Kent Village league. The Selling Cavaliers resulted from an amalgamation of the Selling Sports Club and the Canterbury Cavaliers a few years ago when the latter lost the use of their cricket pitch. We are a friendly club with players predominantly from Selling, Faversham and Canterbury. Please contact Susan Shaw if you are interested if you require further information. The club plays at a picturesque ground in Selling about half a mile from the White Horse pub going towards Boughton and is in the Kent Village league. The Selling Cavaliers resulted from an amalgamation of the Selling Sports Club and the Canterbury Cavaliers a few years ago when the latter lost the use of their cricket pitch. We are a friendly club with players predominantly from Selling, Faversham and Canterbury. Please contact Sue Shaw the Parish Clerk for details if you are interested in joining the club or require any further information. The club plays at a picturesque ground in Selling about half a mile from the White Horse pub going towards Boughton and is in the Kent Village league. The Selling Cavaliers resulted from an amalgamation of the Selling Sports Club and the Canterbury Cavaliers a few years ago when the latter lost the use of their cricket pitch. We are a friendly club with players predominantly from Selling, Faversham and Canterbury. Please contact one of the following if you are interested in joining the club or require any further information. The club plays at a picturesque ground in Selling about half a mile from the White Horse pub going towards Boughton and is in the Kent Village league. The Selling Cavaliers resulted from an amalgamation of the Selling Sports Club and the Canterbury Cavaliers a few years ago when the latter lost the use of their cricket pitch. We are a friendly club with players predominantly from Selling, Faversham and Canterbury. Please contact one of the following if you are interested in joining the club or require any further information. Selling & District Women's Institute was formed in 1951. The WI meets in Selling Village Hall every second Thursday in the month, starting at 12:30pm. The monthly meetings open with a welcome by the President, followed by WI business. There then follows either a talk by a guest speaker or a demonstration, with the meeting concluding with a lovely home made tea by members. New members of all ages are very welcome; our yearly subscription is £31.50. We host craft evenings for members at Selling Village Hall every third Friday in the month, starting at 6.30pm. If you would like to join us, or just want to visit us, then we would be very pleased to see you at any of our monthly meetings. Village Hall - available for hire.